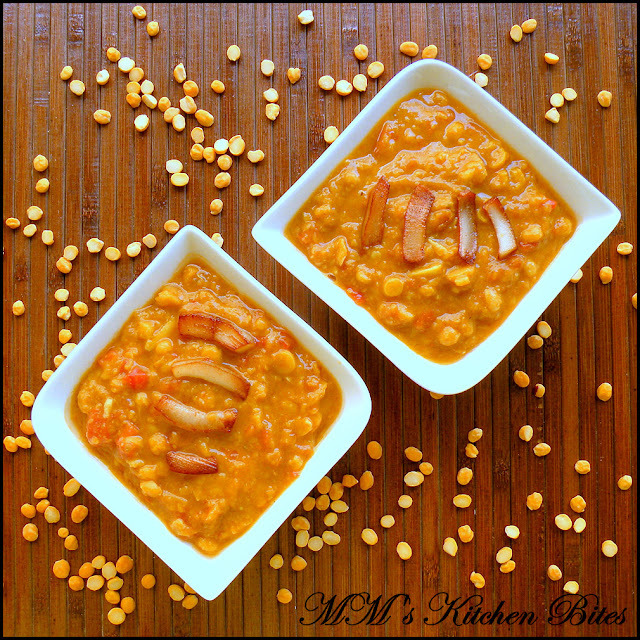 MM's Kitchen Bites: Bengali Cholar Dal...love guaranteed at first bite!! Bengali Cholar Dal...love guaranteed at first bite!! Wash and soak the dal for about half an hour. Drain and pressure cook/in a pan with water, turmeric, salt and ginger paste. (if pressure cook – one whistle on high, and then 10 minutes on low). Dal should be cooked and soft but not go completely mushy. Mix cumin powder, coriander powder and red chili powder with a tablespoon of water and keep aside. Smoke mustard oil in a pan, lower the flame and fry the coconut pieces till light golden. Take them out and keep aside. In the same oil and still on low flame, add bay leaf, red chilies, cardamoms, cloves and cinnamon. After about 10-15 seconds, add garlic and fry well. Add the chopped tomatoes. Once tomatoes go a little mushy, add the spice mix mixed with water kept aside earlier. Let the tomatoes cook till absolutely mushy and oil separates. Pour this mixture into the dal along with the sugar. Dal needs to boil again with the tomato mix - add about half cup water at this stage, if needed. Let it come to a boil and simmer for 10-15 minutes till it reaches a thick consistency. Add in the ghee and garam masala powder just before taking off the heat. Garnish with fried coconut pieces and serve with luchi/puri, parantha or pulao. A very new recipe to me....looks so creamy,yum and comforting ! Made this, but stopped in my tracks when I got to the tomatoes.... how many chopped tomatoes go in? I used one, but it didn't seem like enough. Thanks! Flax Seed Chutney...end of one of the dramas!! Cottage Cheese Fried Rice...Hungry Kya? ?